1st printing. 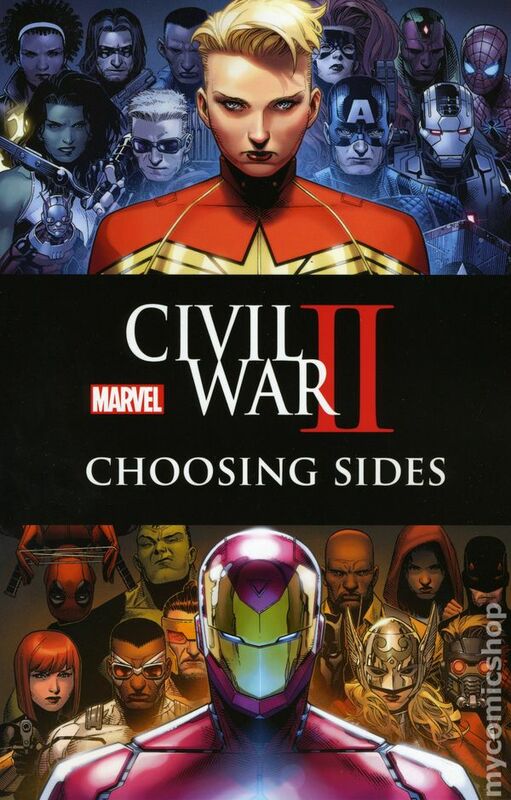 Collects Civil War II: Choosing Sides (2016) #1-6. Written by Declan Shalvey, Brandon Easton, Chad Bowers, Chris Sims, Jeremy Whitely, Brandon Thomas, Derek Landy, Ming Doyle, Charlie E. Brown, John Allison, Chip Zdarsky, and Enrique Carrion. Art by Declan Shalvey, Paul Davidson, Leonardo Romero, Filipe Andrade, Marco Rudy, Marguerite Savage, Chris Visions, Rosi Kampe, Stephan Byrne, Ramon Perez, and Annapaola Martello. Cover by Jim Cheung. If you knew something bad was about to happen, how far would you go to stop it? The line is drawn as that question divides the Marvel Universe. And when a major loss sends shockwaves through the super-hero community, everyone will be forced to reconsider whether they chose the right side! Face these fateful decisions alongside Nick Fury, Night Thrasher, War Machine, Punisher, Kate Bishop, Jessica Jones, Colleen Wing and Tom Foster, a.k.a. Goliath! Friendships are shattered among the Avengers! Alpha Flight and the White Fox join the fray as the conflict goes global! And as the collateral damage mounts, somebody call Damage Control! Softcover, 144 pages, full color. Cover price $19.99.